AFib is the most common heart rhythm disorder, it can lead to heart failure and it is a major risk for stroke. Normally, when your heart contracts it completely drains the blood, but when it contracts irregularly, some blood can stagnate, which can lead to blood clots and strokes. Some people who have AFib don’t know they have it and don’t have any symptoms. Others may experience palpitations or shortness of breath. Simply place your fingers on the watch case and in 20 seconds it will record an electrocardiogram. The heart is a muscle triggered by an electrical signal. This signal can be recorded and is called an electrocardiogram, or ECG. 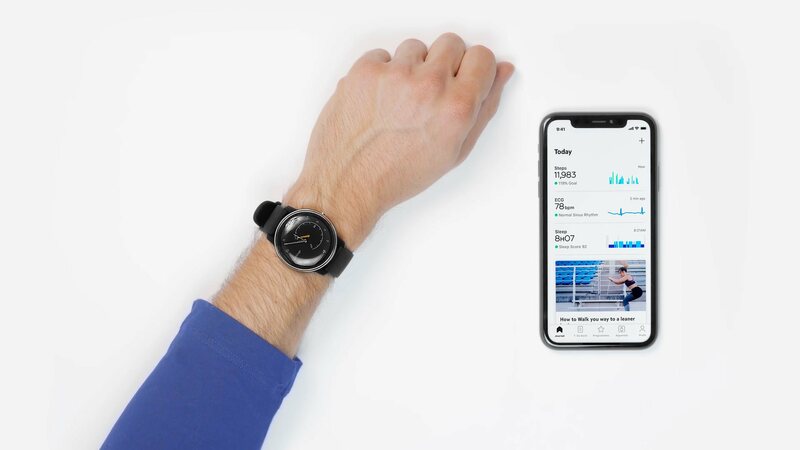 With Move ECG, if you feel an episode is happening, you can immediately take a measurement thanks to three electrodes: two in the back of the watch, and another on the ring you hold during the measurement. During the measurement, your ECG signal appears instantly in the Health Mate app. Then, the app alerts you if you need to consult your specialist and your ECG records can be easily sent to your doctor. It is well known that activity can have a positive impact on cardiovascular health. This is why Move ECG also features automatic activity tracking, connected GPS via smartphone, and an altimeter to measure stair climbing—all to help you go the extra mile. With Move ECG you have a watch, a personal trainer, and the ability to never miss an AFib episode. And thanks to its 12-month battery-life, and water-resistance up to 50m, it can move with your life, and motivate you to get on the path to better health. Join the Move ECG early notification list.